DJ Khaled is no stranger to the sneaker game and has been making waves this week after he gave us an exclusive tour of his closet. As it turns out, even with his massive collection, he doesn&apos;t always have a pair of sneakers on his feet. Today he took to Instagram to share his "ANOTHER ONE" slides from ISlide and announce that his album is coming. As one of his signature catch phrases, "ANOTHER ONE" has taken the world by storm from his tracks to some of the funniest memes on the net. 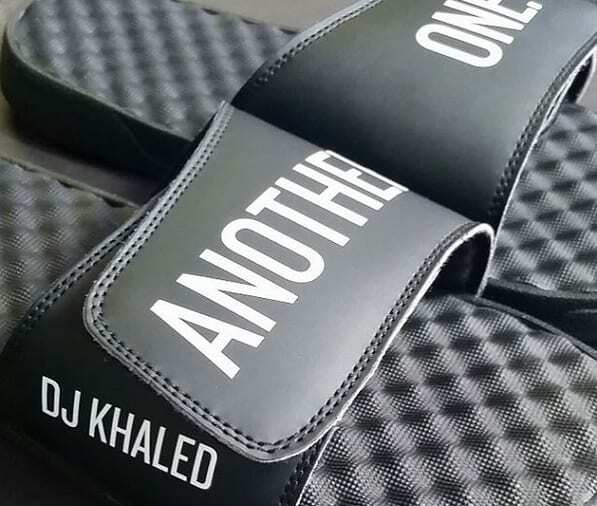 Never one to shy away from stunting, Khaled can now walk around proudly displaying his latest tagline on his feet. No word on whether these are a custom pair or a collaboration that will hit the masses, but let&apos;s hope that him and ISlide have "another one," or a few, for the rest of us.